If you think you have control of your money, you’re wrong! 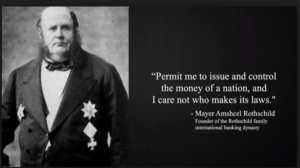 The banks control your money and the Federal Reserve or whatever Bank is the Central Bank in your country controls the banks. Think about how much turmoil was caused when Bitcoin hit the scene and everyone was concerned; mainly banks and governments. For the first time people could conduct financial transactions without the need of a bank or financial institution. Why would countries BAN or OUTLAW the use of BITCOINS? The Central Banks would lose control and the governments of the world would no longer need them. Most of all, they would lose control of the people and lose their ability to profit off our labor and their ability to collect fees from our financial transactions. Do You Remember When the U.S. Dollar Was Backed by Gold? Having a currency backed by gold limited the amount of money that could be printed. That all changed on August 15, 1971, when President Richard Nixon directed the Treasury Department to take the United States off the Gold Standard. 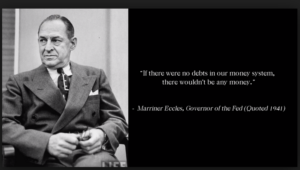 Since that day, the United States and the rest of the world has been operating on Fiat Currencies, and we have been stacking paper money since then. The paper money in your pocket is only a representation of REAL MONEY! Why would you want a representation of money when you can have the REAL THING? Your government and the banks don’t want you to have the real thing, because having real money would give you control of your money. Real money provides you with the ability to control and increase your wealth and give you the same power as the wealthy, and the wealthy don’t want you to have that power because that will make you their equal. Gold has been used as a currency and a store of wealth for over 5,000 years. Because of the security of carrying a large amount of gold from one place to another to pay for goods and services, man decided to come up with a medium that would have the same value as gold; but was easily transported. 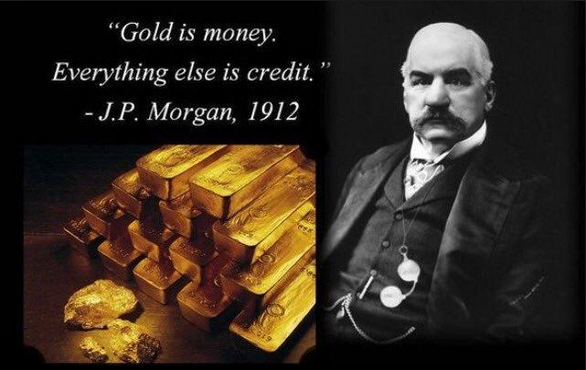 Paper currencies have been used as means of paying for goods and services for years, and they were actually backed by gold until man in his infinite wisdom decided he wanted to print more currency than he had gold. 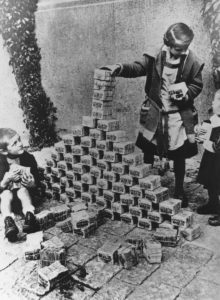 Those are not bricks being stacked by the kids, those are bundles of German Marks. 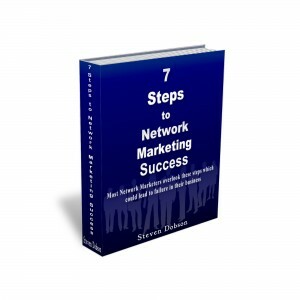 It is said it costed 386,000 Marks for a loaf of bread in Germany in the 1920s. Shortly after this period is when Germany started its war campaign, and once they invaded and took over a country, they immediately took over the countries gold supply. Countries started to get ahead of the German war campaign and started to move their gold supply around the country and in some cases out of the country. Because you can save in gold and get paid when you refer others who save their money in gold. Gold is not subject to the ups and downs of the stock market. As a matter of fact, when the market is in turmoil, the price of gold rises. Gold’s value has increased over time, while the value of a dollar has decreased by approximately 96 percent over the last 100 years. Example: In 1971 an ounce of gold was approximately $45 an ounce, and it took about 46 ounces to buy a new car that cost approximately $2100. Today with the gold price over $1200 an ounce and the price of a new car approximately $21000 you can buy 2 and ½ cars for the same 46 ounces of gold (1200 x 46 = $55200). Crypto Currencies are here to stay so you should invest in them and have them as part of your financial portfolio and start taking back control of your money. 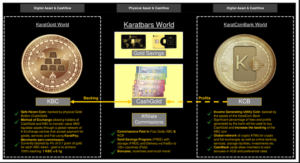 KaratCoin Bank Crypto Currency the KCB coin is now in Pre ICO (Initial Coin Offering) and you can purchase them for 0.14 cents Euro. When we are in the ICO Phase, they will rise to approximately 0.60 cents Euro. Currently you can get up to 60 percent in bonus KCB coins if you purchase by November 30, 2018. There is an additional bonus of 100 percent in bonus coins, but this 100 percent bonus drops to 50 percent bonus on November 21, 2018. If you buy one of our Combo Packs, you will be gifted our second Gold Backed Crypto Currency, the KBC coin. Starting July 4, 2019, you will be able to start exchanging your KBC coins at the rate of 100 coins for 1 gram of gold, and in Jan 2020 it will be 75 coins for 1 gram of gold, and eventually both the KBC and KCB coin will be at the exchange rate of 1 coin for 1 gram of gold. Our 15k Euro Combo Packs will get you over 200k KBC coins and over 500k KCB coins. You could exchange 200k KBC coins and earn 5x your original investment and still have over 200k KCB coins and over 300k KBC coins. You’re not just getting gold and gold backed crypto currencies, you’re getting a whole financial Ecosystem backed by gold. Click the link below to take back control of your money and start saving your money in gold to increase your wealth; and purchase the KCB coins and get free KBC coins to drastically increase your wealth in the short term. I Want Control of My Money!